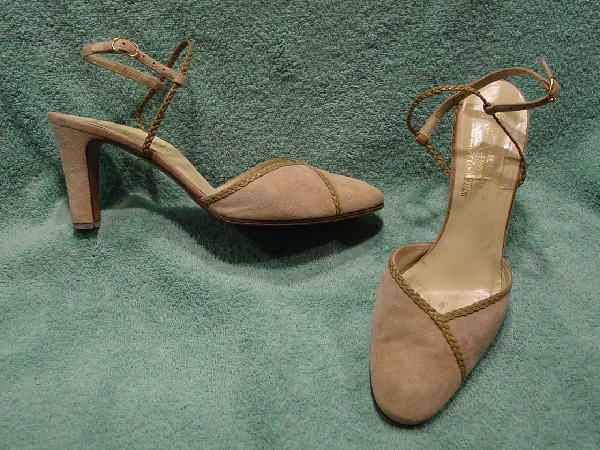 These vintage ankle strap heels have closed modified rounded toes and are backless. They are in a beige-bone soft suede (not as tan as it appears in the picture), and are from the Amalfi Designer Collection. There is a taupe-beige braided leather strap which holds the suede ankle straps and two braided accent strips on the front of the shoe. They were made in Italy. They're from a former British model who wore them on castings. She said they were comfortable to dance in.